CD Projekt says that gamers will be happy with the Xbox 360 version of The Witcher 2, even if they have to wait a little longer than expected. The release for the Xbox 360 version of CD Projekt's dark and gritty RPG The Witcher 2 has been pushed back from late 2011 to the first quarter of 2012. 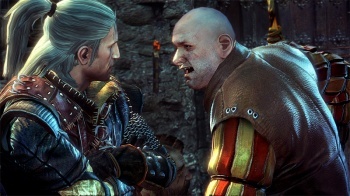 CD Projekt attributes the delay in part to the legal dispute between CD Projekt and Namco Bandai over who has the rights to publish the console version in Europe, as well as the former's decision to remove the game's DRM on the PC. While the whole story is undoubtedly much more complicated, the short version of the dispute seems to be that because Namco Bandai published the PC version of the game in the PAL territories, it believes that it should have received first refusal to publish the Xbox 360 version. But unfortunately - for Namco Bandai anyway - CD Projekt brokered a deal with THQ instead. Namco Bandai also claims that CD Projekt's removal of the game's DRM on the PC in a recent patch was a breach of contract. CD Projekt's Adam Kicinski tried to put a positive spin on the delay, and said that it would give the studio extra time to polish the game. He said that CD Projekt would have more information on how the game would be released on the Xbox 360 closer to release, and added that he was confident that gamers would be very happy with what the studio had in store for them, even in spite of the delay.